Strategic workforce planning – myth, magic or must do? Ask five people what strategic workforce planning is and you’ll likely get five different answers. Whilst there’s a growing demand for strategic workforce planning in the market, there seems to be less clarity on what it actually is, or what’s required to deliver it. How can this be the case when the organisation is essential to delivering business strategy and solving complex business challenges? I’ve posed this question to a number of companies, and it seems the answer is clear: senior management teams are failing to extract maximum shareholder value from their current operating models and organisational data. What they often don’t realise is that organisation realignment to the strategy is not a one off event. In fact, it’s a crucial ongoing process that’s key to labour effectiveness and costs. And underlying this entire process? Strategic workforce planning. In practice there are three broad levels, each with a different purpose, time horizon and approach. Scheduling for the next day, week or month, e.g. staff rostering and project allocation. Workforce sizing and budgeting, projecting forward from the current base using scaling and seasonality factors for the coming months, quarters or year. This is a continuous outlook, often in monthly steps. Determining the nature of the workforce one or more years in advance, based on a range of external influences and internal drivers. Any contextual step-changes – like automation, new products, change in geographies and competition or new business strategy – alter the work profile. This means the workforce type, shape and size may need to change too. Strategic workforce planning offers a future snapshot of the organisation as it will need to be for business effectiveness at that time, and should inform all operation and tactical activity behind it. The process of strategic workforce planning is often as valuable as the outcome. By considering business drivers and getting executive alignment on priorities, you can not only focus on the most important opportunities and threats, but also facilitate a common business roadmap. This roadmap is invaluable, enabling HR and the business to align the organisation to deliver the business strategy. It also assists HR to refine its operational processes (talent, diversity, recruitment, performance and reward) to ensure the required people plan is achieved. Download our 68 page research report for actionable insights on strategic workforce analytics and planning. How is it different from organisational design? A strategic workforce plan includes a high-level ‘to-be’ organisation for a specific point in the future, and a plan on how to transition to that. It combines the roles structure, the positions scale, the work to be done and the competencies required, as well as highlighting the main changes from the existing organisation. But extrapolating into the future is fundamentally different to organisation redesign. While the approach is similar, strategic workforce planning is position rather than people based, and it works to a wider time-frame, with a longer transition plan that may have intermediate stages. Organisation design should focus on constraints, risks and anomalies in the current talent pool in refining or redesigning the operating model. It is a full FTE design, where all the numbers add up. Strategic workforce planning anticipates the business and talent model needed for changes in the business in the future. It does not need to be comprehensive. Most value comes from focusing on the workforce segments that will have most impact on the business in the future, including those that will change the most or are particularly specialised. The key is not to try to cover everything. Strategic workforce planning is more of a qualitative than a quantitative exercise. Different approaches can be taken to different types of role. In considering roles that will change the most, it is also important to include ancillary roles, such as managers, co-ordinators and others who interact. 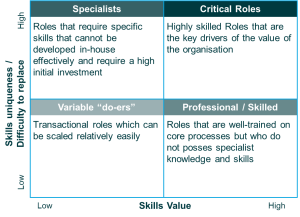 For roles that will change a lot, consider forward looking activity mapping to help understand the nature of the new work and how those roles will evolve, and from that to determine the new competency and talent requirements. Through such high level activity analysis one can determine what work will change, what should be increased, what will be automated or should be substituted or dropped. This also provides the opportunity to clarify and de-duplicate responsibilities. 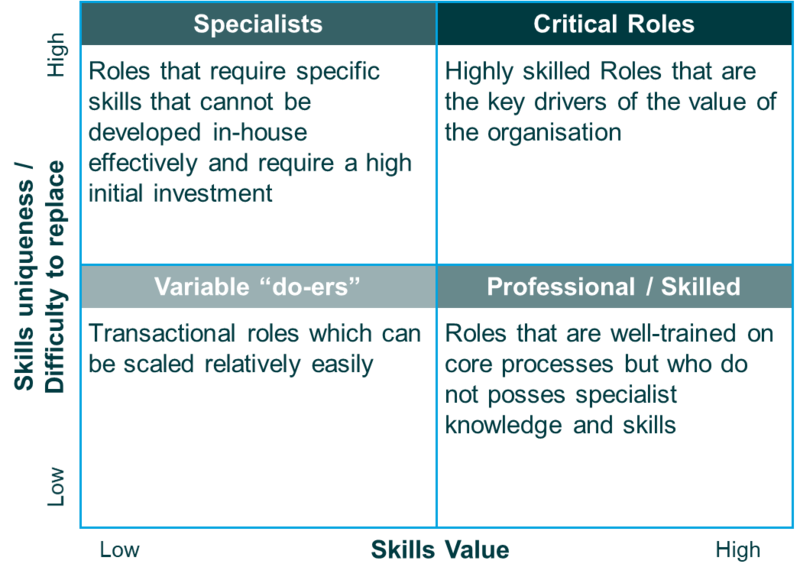 For roles with rare skills one may wish to consider how one grows, values and retains those skills. For roles that don’t change much in nature but may change in volume consider a more arithmetical scaling approach. How to get started in strategic workforce planning? We see pockets of strategic workforce planning excellence in the market but less scalability or repeatability. It is ironic that strategic workforce planning is reliant on rare skills and experience. We expect that to change as more organisations see how valuable it can be to be prepared for future organisation and talent needs. The key is for organisations to be closely involved in their own strategic workforce planning. When this is outsourced plans decay over time and organisations struggle to refresh what has been done. There is more value in focusing on what can be delivered and repeated in-house, even if that is quite simple initially (e.g. focus more on scaling and delivering change through training). Building in-house capability in strategic workforce planning will lead to a more sophisticated approach and increasing value over time. Success in strategic workforce planning, as with other change initiatives, comes from leadership, stakeholder management, governance, approach, process and data. The right tools to make this easier, more agile and repeatable also make a big difference. 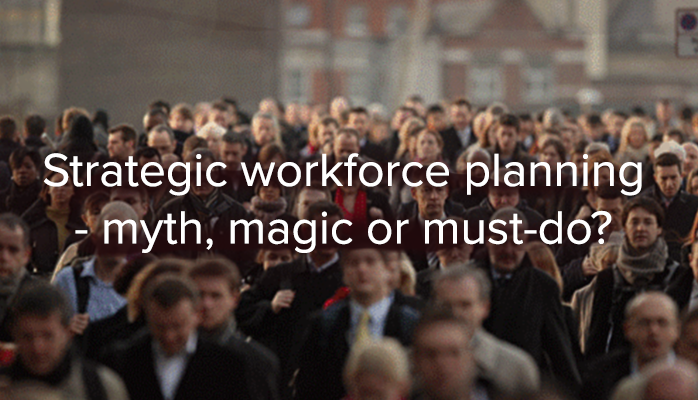 Strategic workforce planning isn’t a myth, it’s a must-do – with the potential to be magic. Find out how OrgVue can help you align your organisation to your business strategy.